← Today I am a proud Minnesotan! Fleetwood Mac is my favorite band. I always wanted to hear them in concert. Tuesday night I got to! Me: Dad. I discovered this new band. They’re amazing. Me: Yeah. They’ve been around for a while. They’re called Fleetwood Mac and they have this incredible album called Rumours. Me: Yes. I said it was new to me. Not new. Have you ever heard of them. Dad: (More hysterical laughter) Yes. The album is downstairs. When MY DAD retells this conversation he continues to insert the hysterical laughter just from the memory of this conversation. Anyway, last night I got to see Fleetwood Mac in concert and it was AMAZING. I told you I was a serious fan. (I’d never written down a set list from a concert while the concern was happening and now I know I never have to do so thanks to google). They played for two and a half hours without break. Lindsey Buckingham is a phenomenal guitar player. If you’ve never seen him live, find a YouTube video or something. Mick Fleetwood and John McVie were amazing on drums and bass, respectively though I didn’t expect anything less. 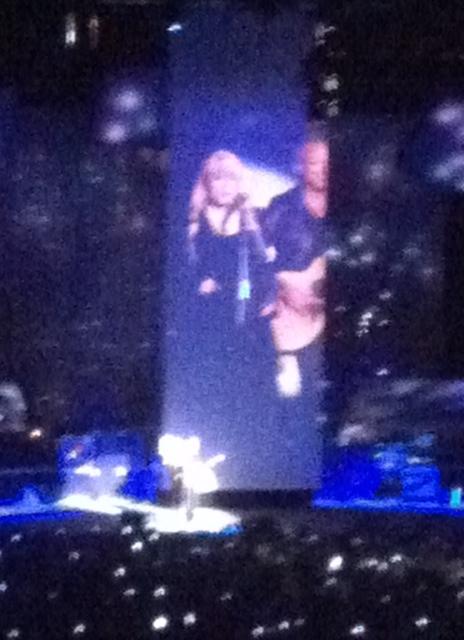 Stevie Nicks was good, not great. It seemed like she was having trouble hearing and sometimes lyrics were a bit off from the rest of the group. The band’s energy was awesome. I’m still singing their songs days later. This entry was posted in memories, Uncategorized and tagged about me, family, memories. Bookmark the permalink. That’s Pink Floyd but we will let it go. Going in July to hear them! Can’t wait. Wish Christine MacVie was still with the group for “All Over My Head” and “Little Lies”. For now “Sara” will be just fine.